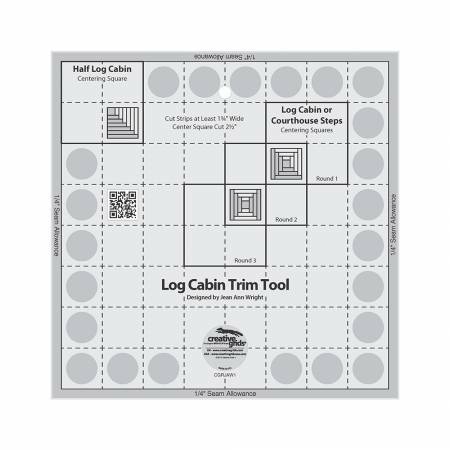 After adding each round of “logs”, place the appropriate centering square on the ruler over the 2 inch finished center square and trim. Since each round is squared up before the next set of logs are added, the results are spectacular. The suggested strip widths are printed right on the template! The template slides easily over the fabric until pressure is applied. Then, our exclusive gripper holds the fabric in place while cutting, eliminating slipping and miss-cuts! Adele's Tips: Starch your strips to prevent stretching. Don't get too fussy with strip widths. As long as there is one straight side and it's wide enough use it. Use a silver "sharpie" to temporarily mark the number on the square for better visibility.